"New" for 2019 - What's up everybody? Time for a Friday Night Fight! 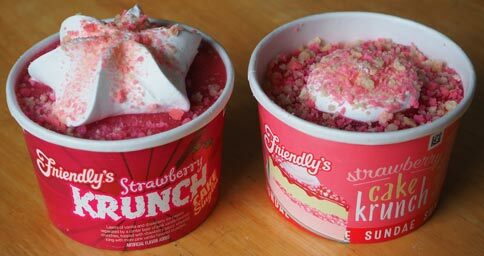 We've got last year's Strawberry Cake Krunch Sundae vs this year's Strawberry Krunch Cake Single. Yes, those are different things. Will the 8.5 oz noob crush the old 6.5 oz cup? Who knows! 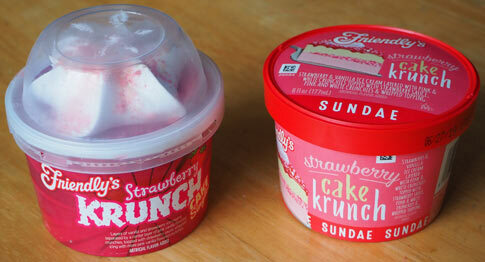 Well, I mean I know because I've already eaten half of both of these, but let's pretend like there is suspense here! Unwrapped... because we need all the facts! I know we usually go round by round here comparing various aspects, but as the pictures show you, these two treats are nearly identical. Besides having more whipped cream and more sauce, I can't really tell any difference between these two. Apparently we have been hornswaggled! Or have we???? Like how I brought the suspense back there? I will say that the newer and more plentiful sauce does seem to be stronger than the old sauce in terms of both flavor and sweetness. How much? Well, so much so that I would suggest that those who don't love sugary things not taste the sauce alone. It's pretty crazy potent. I mean it's fun, like "WHOA That's potent!" but obviously that's not for all of us. So, is the upgraded price justifiable? Yes and no. Only the sauce is changed, and there's just more of the whipped cream. I like both of these factors but I just wish this felt more like a heftier ice cream cake. The ice cream here is decent, but it's not mind blowing or anything. How about this? 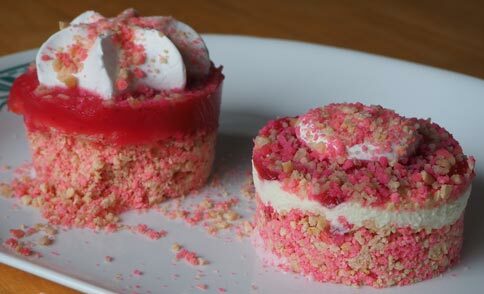 This doesn't deserve the "new" tag but it is a fair alternative to trying to eat an entire ice cream cake by yourself. Let's be honest, ice cream cake's don't really fit in the freezer that well, and you have to let them defrost before you cut them, and the crunchies go everythere. This makes more sense when other people aren't involved. I suspect I'll pick this up on occasion because I do love a sweet, strong, strawberry flavor, and for the most part that is delivered here as long as you get some sauce in every spoonful. On Second Scoop: As I finish these for breakfast, I realize I forgot to mention one thing. Considering that KRUNCH is in both of their names, you might expect some kind of actual crunch factor. Well, yeah, not going to be the crunch you might expect. There is a texture change, but it's not that good solidness you might get from the chocolate crunchies in a Carvel ice cream cake. So, yeah, that's all I got. This is better than the old version, but it could be better still.